From May to September, Enid has a Farmer’s Market that’s open on Saturdays. This past weekend, we decided to check it out. I’m used to the Farmer’s Markets of Florida, full of freshly picked oranges and grapefruits, and a plethora of other local produce. That’s sort of what I was expecting in Enid, but I guess I forgot not much grows in Oklahoma besides wheat. There was no local produce to be found, only a few boxes of organic fruits from Texas and California. 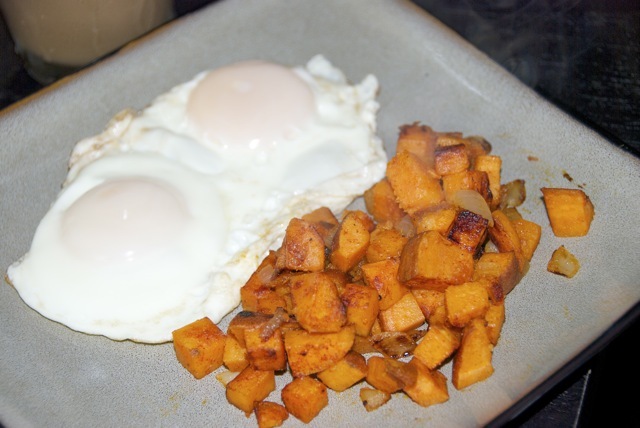 The yolks of the eggs were super bright compared to a supermarket egg, and there was no comparison on taste. I wouldn’t have thought you could have a REALLY GOOD egg, but you can. And these were. 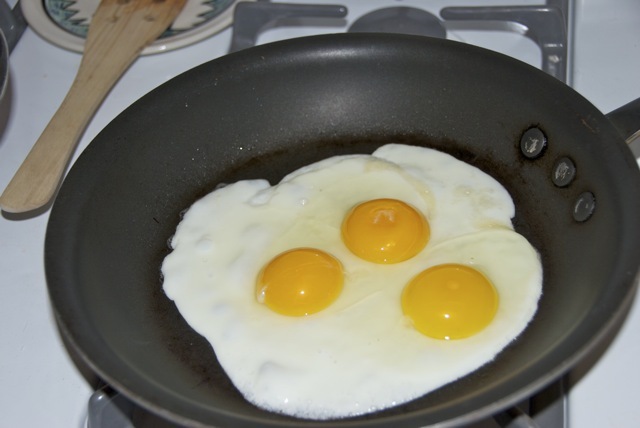 I usually eat my eggs in omelets or big scrambles, but these eggs deserved to be served plain, sunny side up, to really let their flavor shine. So instead of mixing stuff in with the eggs, I decided to make something on the side. 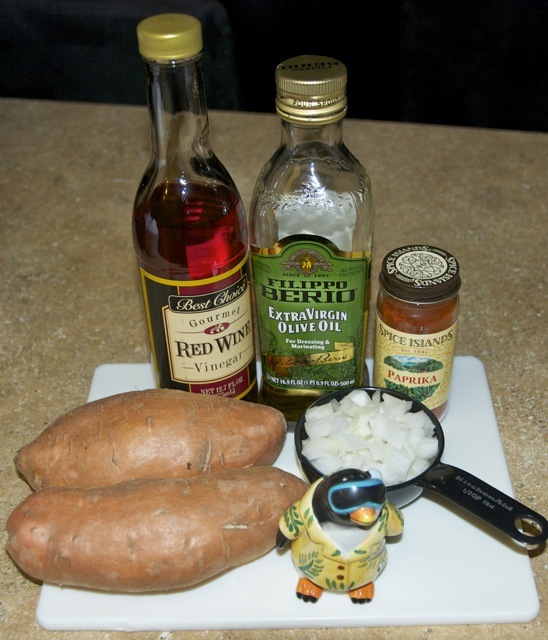 I found this recipe for Sweet Potato Hash on the Food Network website. It’s very simple, but I wanted to find something that I already had all the ingredients for. 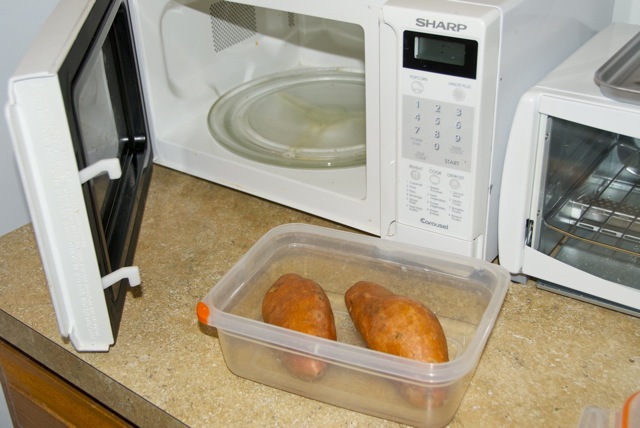 So, the directions in the recipe began: Place potatoes in a shallow (microwave-safe) dish and add about 1/4-inch of water. Cover and microwave on HIGH for 3 to 4 minutes, until just soft. Drain and set aside. I’m kind of slow, so I didn’t realize you were supposed to cut the potatoes BEFORE steaming them. I was complaining about the fact that it was so hard to cut cooked potatoes into cubes when the lightbulb went on… whoops. Ah well, it still worked. But you should cut them first. Also, Robin peeled her potatoes. I like the skin, so I peeled one and left the other whole. Heat oil in a large skillet over medium heat. Add onion and saute 3 minutes, until soft. 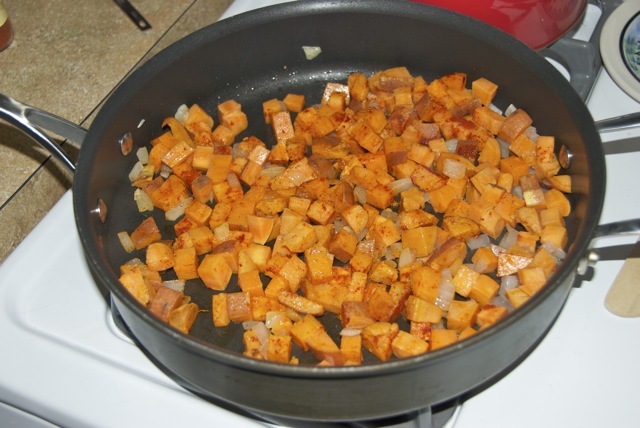 Add sweet potatoes, vinegar and paprika and cook 3 to 5 minutes, until potatoes are golden. Season, to taste, with salt and black pepper. At the last minute, I also added a dash of cayenne pepper. Good decision. I served the potatoes with the farm eggs. Delicious drippy yolks. 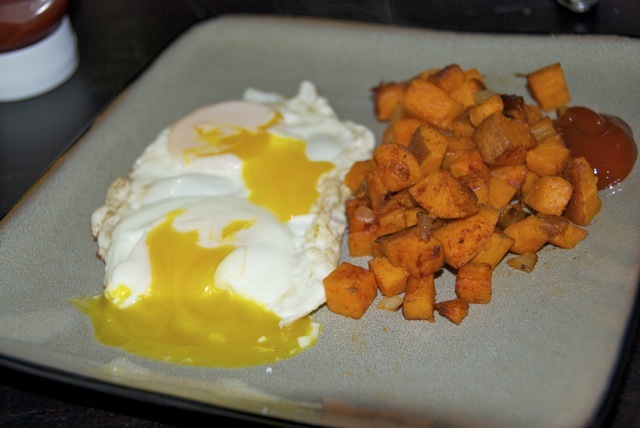 The hash was good, though as I said it was pretty simple. The cayenne definitely kicked it up a little, which was nice. Next time I’ll plan ahead and add in some more flavors! I am about the “geek out” with this one. 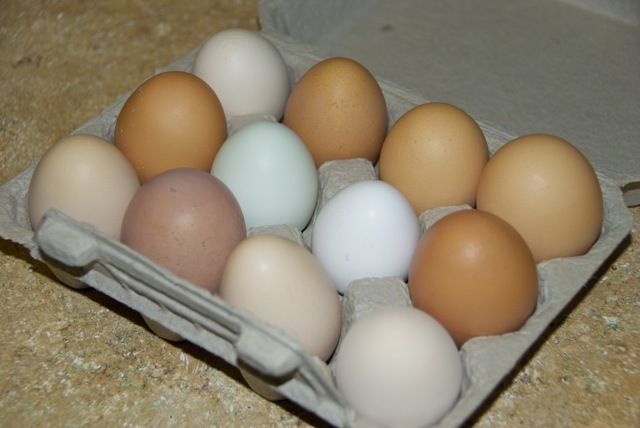 The color of the eggs is determined by the genetics of the chicken. Different breeds produce different colors. As the egg goes through the chicken it picks up pigments that different breeds have. The egg inside are essentially the same. The flavor difference if from the chickens diet.